Non-alcoholic fatty liver disease (NAFLD) is caused by excessive accumulation of fat within the liver, leading to further severe conditions such as non-alcoholic steatohepatitis (NASH). Progression of healthy liver to steatosis and NASH is not yet fully understood in terms of process and response. Hepatic oxidative stress is believed to be one of the factors driving steatosis to NASH. Oxidative protein modification is the major cause of protein functional impairment in which alteration of key hepatic enzymes is likely to be a crucial factor for NAFLD biology. In the present study, we aimed to discover carbonylated protein profiles involving in NAFLD biology in vitro. Hepatocyte cell line was used to induce steatosis with fatty acids (FA) in the presence and absence of menadione (oxidative stress inducer). Two-dimensional gel electrophoresis-based proteomics and dinitrophenyl hydrazine derivatization technique were used to identify carbonylated proteins. Sequentially, in order to view changes in protein carbonylation pathway, enrichment using Funrich algorithm was performed. The selected carbonylated proteins were validated with western blot and carbonylated sites were further identified by high-resolution LC-MS/MS. Proteomic results and pathway analysis revealed that carbonylated proteins are involved in NASH pathogenesis pathways in which most of them play important roles in energy metabolisms. Particularly, carbonylation level of ATP synthase subunit α (ATP5A), a key protein in cellular respiration, was reduced after FA and FA with oxidative stress treatment, whereas its expression was not altered. Carbonylated sites on this protein were identified and it was revealed that these sites are located in nucleotide binding region. Modification of these sites may, therefore, disturb ATP5A activity. As a consequence, the lower carbonylation level on ATP5A after FA treatment solely or with oxidative stress can increase ATP production. The reduction in carbonylated level of ATP5A might occur to generate more energy in response to pathological conditions, in our case, fat accumulation and oxidative stress in hepatocytes. This would imply the association between protein carbonylation and molecular response to development of steatosis and NASH. Non-alcoholic fatty liver disease (NAFLD) is associated with the accumulation of excess fat in liver . NAFLD was described as a medical condition where deposition of fat within the liver is more than 5% of hepatocytes [2–4]. Global prevalence of NAFLD is estimated to be as high as 25.24% . NAFLD usually causes liver injuries and increases risk of other fatal diseases, such as liver fibrosis, cirrhosis, and hepatocellular carcinoma [2, 3]. Two stages of the disease have been proposed: i) simple steatosis or fat-accumulated liver and ii) non-alcoholic steatohepatitis (NASH) or fat-accumulated liver with inflammation [2, 3]. The development of NASH presumably results from induction of oxidative stress to steatotic liver [1, 2]. However, specific treatment of NASH is yet to be fully defined. In addition, the specific therapeutic targets remain to be discovered . Oxidative stress, a condition in which pro-oxidants exceeds the level of antioxidants, can cause damage to cells and other macromolecules, including proteins [6, 7]. Oxidative modification of proteins can be caused by different mechanisms, such as sulfation and carbonylation [6, 8]. Protein carbonylation is the introduction of carbonyl group to proteins by the reaction with pro-oxidants or lipid peroxidation reaction [6, 9]. Typically, carbonylated proteins are aggregated and can also cause conformational change, resulting in alteration of enzyme activity [9–12]. However, recent findings indicated roles of carbonylation on protein biology. The alteration in carbonylation could be novel signaling pathway and responsive mechanism against various stress conditions [13–15]. Though the alteration of protein carbonylation has been widely studied in several diseases [11, 12, 15, 16], association of protein carbonylation with steatosis and NASH has not been fully studied yet. According to two-hit model in NAFLD, development of steatosis and NASH occurs from an increase in lipid accumulation followed by induction of oxidative stress. The subsequent oxidative stress not only causes cell injuries, but also contributes to oxidation of lipids and proteins, including protein carbonylation. The effects of protein oxidation on NAFLD progression was previously described but the specific impact of protein carbonylation on this disease has never been studied before [6, 9, 17–20]. In the present study, we aimed to identify carbonylated protein profiles in response to induction of lipid accumulation and oxidative stress in vitro. The findings of this study provide more insight into developmental process and cellular response to NAFLD, which can be useful for further development of therapeutic agents in future studies. HepG2 cells were purchased from ATCC (Rockville, MD, USA). Nile red, oleic acid, menadione (MND), trypsin and malondialdehyde (MDA) assay kit were obtained from Sigma-Aldrich (St. Louis, MO, USA), while palmitic, dihydroethidium and luminata forte chemiluminescence substrate were from Calbiochem (EMD Millipore, Billerica, MA, USA). 4′,6-diamidino-2-phenylindole, dihyrochloride (DAPI) and simple blue safe stain were purchased from Thermo Fisher Scientific (Waltham, MA, USA). Oxy-blot, protein oxidation kit, protein G beads and anti-ATP synthase subunit-α (ATP5A) antibody were obtained from Merck (Darnstadt, Germany). Immobiline dry strip (7 cm, pH 3–10 NL) and 2D clean-up kit were purchased from GE Healthcare (Little Chalfont, UK). Other chemicals were of analytical grade and used as received. HepG2 cells were cultured in minimum essential medium (MEM) with 10% fetal bovine serum (FBS) in a humidified 5% CO2 incubator at 37 °C. Induction of lipid accumulation was performed according to previously published data [18, 19]. Briefly, HepG2 cells were cultured in media supplied with 200 μM oleic acid and 100 μM palmitic acid for 72 h. Level of lipid accumulation was evaluated by confocal microscopy and flow cytometry. Confocal microscope was used to visualize cytoplasmic lipid droplet. HepG2 cells were cultured and treated with FA as mentioned above. Cells were fixed with 4% paraformaldehyde for 30 min at room temperature and stained with 3 μg/ml nile red, 0.1 μg/ml DAPI and 0.2% saponin in phosphate buffer saline (PBS) for 15 min in light-protected conditions. Cells were washed and analyzed with confocal microscope LSM700 (Zeiss, Germany) under original objective 20X with 488 nm laser and green channel for nile red, and 405 nm laser and blue channel for DAPI. Moreover, number of lipid-accumulated cells was quantified using nile red staining and flow cytometry. Cells were collected and fixed with 1% paraformaldehyde at 37 °C for 10 min and stained with 0.1 μg/ml nile red and 0.2% saponin in PBS for 10 min. Cells were injected into FL500MPL flow cytometer (Beckman Coulter, Pasadena, CA, USA). Ten thousand cells from the normal population zone were gated. High complexity and FL2-channel fluorescence intensity cells were counted as lipid-accumulated cells. Untreated and FA-treated cells were subsequently treated with increasing concentrations of oxidative stress inducer, MND. 3-(4,5-dimethylthiazole-2-yl)-2,5-diphenyltetrazolium bromide (MTT) assay was used to determine the highest concentration of MND that did not affect cell proliferation. The assay was performed based on a previously described method , with some modifications. In brief, HepG2 cells were seeded and treated with FA as mentioned above. Then, 0, 12.5, 25, 37.5, 50 μM of MND in culture media were added to untreated and FA treated cells and further incubated for 24 h. Media was removed and 0.5 mg/ml MTT was added and incubated for 4 h. MTT solution was discarded, followed by the addition of dimethyl sulfoxide. The absorbance at 540 nm was measured by a Sunrise plate reader (Tecan, Maennedorf, Switzerland). Both cell conditions were treated with 25 μM MND and markers of oxidative stress were detected. Cells from all the four conditions: no treatment, MND treatment, FA treatment, and FA/MND treatment, were subjected to lipid peroxidation reaction using MDA assay kit. Cells were collected and lysed by adding lysis buffer containing butylated hydroxytoluene. Cell lysates were centrifuged to remove debris and supernatant was transferred to a new tube. Thiobarbituric acid was added into each tube and incubated at 95 °C for 1.5 h. Thereafter, samples were cooled down to room temperature and the readings were recorded using SynergyH1 multi-mode fluorescence reader (Biotek, Vermont, USA) with 532 nm excitation wavelength and 553 nm emission wavelength. Level of superoxide was measured for all 4 conditions utilizing flow cytometry. Cells were stained with 5 μM dihydroethidium in PBS for 30 min at 37 °C in light-protected conditions. Cells were collected and fixed with 1% paraformaldehyde. Then, cells were injected into FL500MPL flow cytometer. Ten thousand cells from the normal population zone were gated. Cell with high FL1 fluorescence signal were counted as positive cells. Proteins were extracted using lysis buffer (5 M urea, 2 M thiourea, 4% 3-((3-cholamidopropyl) dimethylammonio)-1-propanesulfonate (CHAPS), 50 mM dithiothreitol (DTT)). Cells were incubated on ice with lysis buffer for 1 h and centrifuged to collect protein lysate. Protein concentration was measured using Bradford reagent. Derivatization of carbonylation on the proteins was performed with Oxy-blot, protein oxidation kit. In brief, 500 μg protein was denatured with 12% sodium dodecyl sulfate (SDS) and further derivatized with DNPH solution at room temperature for 25 min. Reaction was terminated by addition of neutralizing solution, followed by western blotting of carbonylated proteins to ensure successful derivatization. Protein samples were separated on 10% SDS-polyacrylamide gel electrophoresis (PAGE) and then transferred to polyvinylidene fluoride (PVDF) membrane. Membranes were blocked and probed with anti-DNPH antibody overnight at 4 °C. Thereafter, the PVDF membranes were incubated with secondary antibody, followed by incubation with luminata forte chemiluminescence substrate and the immunoreactive bands were visualized using ImageQuant LAS 400 imager (GE Healthcare). After DNPH derivatization, salts and detergents were removed using 2D clean-up kit, then protein concentration of each sample was measured using Bradford reagent. 100 μg of derivatized protein was mixed with immobilized pH gradient buffer (3–10 non-linear (NL)) and 1% bromophenol blue before rehydration using immobiline dry strip (7 cm, pH 3–10 (NL)) at 25 °C overnight. Ettan IPGphor 3 isoelectric focusing unit (GE Healthcare) was utilized to separate proteins according to their isoelectric points with running conditions: 300 V/30 min (Step), 1000 V/30 min (Gradient), 5000 V/90 min (Gradient), 5000 V/35 min (Step), 100 V/hold (Step) with 50 μA current per strip. The strips were reduced with 50 mM DTT in equilibration buffer (75 mM Tris pH 8.8, 6 M urea, 30% glycerol, 70 mM SDS) for 15 min and alkylated with 125 mM iodoacetamide (IAA) in equilibration buffer for 15 min. Strips were then placed over 10% SDS-PAGE and run at 150 V.
Protein expression profile was studied using Coomassie staining, while protein carbonylation profile was determined using anti-DNPH. For protein expression profile, the electrophoresed gels were stained with simple blue safe stain at 4 °C for overnight. Protein gels were destained with water until the background was clear and readings were taken using Image Scanner III densitometer (GE Healthcare). For protein carbonylation profiles, the electrophoresed gels were transferred to PVDF membrane and carbonylated protein spots were detected as mentioned above. Protein spots were analyzed using ImageMaster 2D Platinum software (GE Healthcare). The spots with more than 2-fold differentially expressed or carbonylated were excised for further protein identification. Coomassie dye was removed from protein spots using 25 mM ammonium bicarbonate / 50% acetonitrile and the spots were further reduced by incubating at 60 °C with 4 mM DTT in 50 mM ammonium bicarbonate for 15 min. Protein spots were alkylated with 250 mM IAA at room temperature in the dark for 30 min before dehydration using 100% acetonitrile. 1 μg of trypsin was applied to dried gels, and peptides were collected after overnight incubation. Peptide solution was dried using speed vacuum device CC-105 (Tomy digital biology, Japan) and kept at − 80 °C until analysis. Peptide samples were dissolved in 0.1% formic acid. Spots from protein expression profile were identified using an UltiMate 3000 nano-liquid chromatography system (Thermo Fisher Scientific) coupled with a micrOTOF-Q electrospray ionization quadrupole time-of-flight mass spectrometer (Bruker Daltonics, Billerica, MA, USA). The samples were injected into the machine using 2% acetonitrile and 0.1% formic acid in water as a mobile phase A and 0.1% formic acid in acetonitrile as a mobile phase B at flow rate of 300 nL/min for 60 min. Data acquisition of the mass spectrometer was controlled by Hystar software (Bruker Daltonics). The mass spectra covered mass ranges of m/z 400–3000 and 50–1500. Protein spots from protein carbonylation profile were identified using an UltiMate® 3000 RSLCnano system (Thermo Fisher Scientific) coupled with Q Exactive Hybrid Quadrupole-Orbitrap mass spectrometer (Thermo Fisher Scientific) through EASY-Spray nano-electrospray ion source (Thermo Fisher Scientific). The samples were loaded with 5–7% acetonitrile for 5 min, 7–45% for 60 min, 45–50% for 5 min, and 50–97% for 5 min, followed by washing at 100% at 300 nL/min flow rate for 90 min. Full MS scan was done with mass ranges of m/z 200–2000. Precursor ions with + 1 and greater than + 8 charge state were excluded. Fragmentation of precursor ions was performed using Higher-energy collisional dissociation and data acquisition was collected by Thermo Xcalibur 2.2 (Thermo Fisher Scientific). A Mascot generic file (.mgf) was generated and data were searched against the Swiss-Prot database (accessed on July 1st, 2016) using Mascot version 2.4.1 (Matrix Science, London, UK). Homo sapiens taxonomy was selected for the search setting and one missed cleavage was allowed. The peptide tolerance was set to 200 ppm and the tandem mass spectrometry tolerance was set to 0.6 Da. Methionine oxidation (+ 16 Da), cysteine carbamidomethylation (+ 57 Da), lysine carbonylation (+ 179 Da), arginine carbonylation (+ 137 Da), threonine carbonylation (+ 178 Da), and proline carbonylation (+ 194 Da) were selected for variable modifications. Differentially expressed and carbonylated proteins were enriched with Funrich standalone algorithm . The uniprot accession number and log2 ratio of differentially expressed and carbonylated proteins were uploaded to Funrich version 3.1.3. Pathway analyses based on biological process were performed. Differentially expressed and carbonylated proteins were further analyzed relying on Human taxonomy (ID: 9606). The analysis was performed by gene enrichment option in compare quantity mode and mapped with NAFLD relevant pathways in Reactome database. Protein samples were precipitated and dissolved in immunoprecipitation buffer, 50 mM Tris, 150 mM NaCl, 1% Triton-X. 30 μg of precipitated protein was mixed and incubated with protein G beads and anti-ATP5A antibody for overnight at 4 °C, followed by beads washing with immunoprecipitation buffer solution and addition of 12% SDS into each sample. DNPH solution was added, incubated for 25 min and the reaction was stopped by addition of neutralizing solution. Samples were loaded onto 10% SDS-PAGE gel and western bot analysis was performed using anti-ATP5A and anti-DNPH. Intracellular lipid droplets were visualized using lipid-specific fluorescence dye and confocal microscopy. 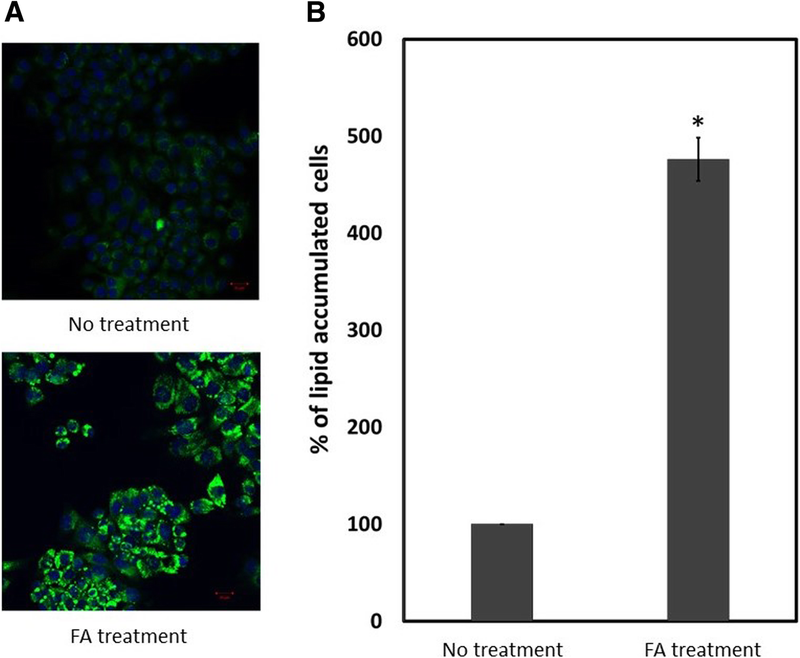 Cytoplasmic lipid droplets in HepG2 cells were remarkably increased after FA treatment as shown by high signal of lipid-specific fluorescence dye (Fig. 1a). Number of lipid-accumulated cells was counted by flow cytometer and fat-accumulated cells were remarkably increased (475%) after FA treatment (Fig. 1b). Hence, this suggested that FA treatment induced lipid-accumulation in hepatocytes and this condition was used as in vitro steatosis in further experiments. According to two-hit model, in the second stage of NAFLD, lipid-accumulated hepatocytes are exposed to oxidative stress. FA-treated HepG2 cells were subsequently treated with MND, an oxidative stress inducer. The maximum MND concentration that cells still survive is 25 μM (Additional file 1: Figure S1). Thereafter, oxidative stress markers were monitored in HepG2 with no, FA, and FA/MND treatment. Lipid peroxidation was significantly increased in both FA and FA/MND treatment (447.9 and 491.4%, respectively) (Fig. 2a). Exposure of HepG2 to FA decreased the production of superoxide (41.6%). However, when the cells were then exposed to MND, the production of superoxide was then rose up to the same level as untreated cells. (Fig. 2b). Changes in protein carbonyl formation were in good agreement with superoxide production (Fig. 2b and c). This demonstrated that we were able to induce oxidative stress to fat-accumulated cells by addition of MND. Protein expression and carbonylation profiles were investigated for untreated, FA-treated and FA/MND-treated cells using 2DE proteomics. Expression of 19 proteins and carbonylation of other 19 proteins were altered after FA treatment (Figs. 3 and 4, Tables 1 and 3). Interestingly, Stitch pathway analysis of differentially expressed proteins was found to correlated with NAFLD pathway (KEGG pathway ID: 04932, false discovery rate: 5.73e-08), indicating that induction of lipid accumulation by FA treatment in this study could be used for investigation of in vitro steatosis. For FA/MND treatment, 19 proteins were differentially expressed and 20 proteins showed alteration in carbonylation level (Fig. 3 and 4 and Tables 2 and 4). However, no association with NAFLD was identified using Stitch pathway analysis. Importantly, using Funrich pathway analysis tool, most of differentially expressed and carbonylated proteins from FA-treated and FA/MND-treated cells were involved in metabolic pathways (Fig. 5). In particular, the carbonylated proteins were mostly mapped in the pathways related to energy and fatty acid metabolisms, cell signaling, p53, cell cycle, inflammation, fibrosis, interleukin, insulin and apoptosis. We hypothesized that alteration in protein carbonylation in those pathways, especially in energy metabolism, by introduction of oxidative stress, may contribute to progression of simple steatosis to NASH. Pathway analysis suggested that the majority of differentially expressed and carbonylated proteins was involved in energy pathway. Hence, in this study, we focused on proteins those play role in cellular energy generation. ATP5A was selected for further analysis because it is a key enzyme in oxidative phosphorylation (OXPHOS), which is responsible for energy production. 2 DE results demonstrated that level of carbonylation of ATP5A, (Fig. 4, spot 51) was 3-fold and 3.7-fold decreased in FA and FA/MND treatment, respectively (Fig. 6, Tables 3 and 4), whereas level of ATP5A expression remained unchanged. 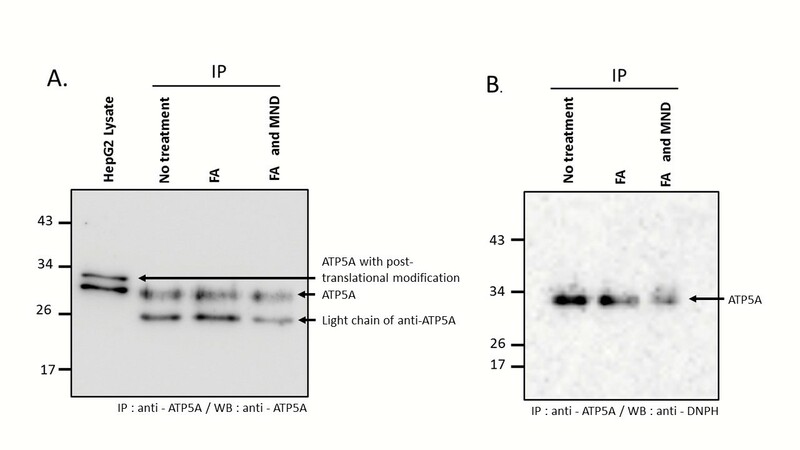 ATP5A was further verified by anti-DNPAH antibody against derivatized carbonylation of immunoprecipitated ATP5A in which immunoblotting results were corresponding to 2DE, (Additional file 2: Figure S2). To identify carbonylation sites, MS results of the carbonylated proteins were subjected to further analysis using MASCOT search engine with parameters set up against carbonylation of four amino acid residues: lysine, arginine, threonine, and proline. 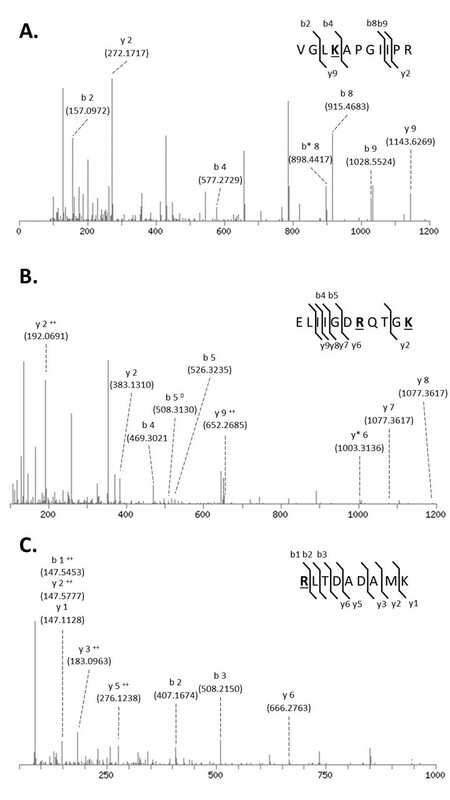 Seventeen carbonylation sites were identified from 6 proteins (Additional file 3: Table S1). K132, R171, K175, and R219 residues were identified as carbonylation sites of ATP5A in which R171 and K175 are located in ATP5A nucleotide-binding region (residues 169–176)  (Additional file 4: Figure S3, Fig. 7a). The presence of carbonylation on the nucleotide-binding region of this protein possibly affects its activity, hence, 3D structure of ATP5A (PDB: 1NBM) was visualized and the interactions between this protein and its substrate, ATP, was studied . 3D structure revealed that ATP molecule interacts with 12 amino acid residues including K175, which its amino group directly interacts with phosphate group of ATP molecule (Fig. 7b). Carbonylation at amino group of K175 affected chemical property of this residue and then interrupted interaction with ATP substrate (Fig. 7c). Our findings suggested that FA and FA/MND treatments altered cellular energy metabolism as well as other pathways that might be associated with steatosis and NASH. Previous in vitro studies showed that FA-treated hepatocyte cell line exhibited similar phenotypes to those observed in patients and in vivo studies [19, 25, 26]. In addition to lipid accumulation, treatment of FA also induced oxidative stress, lipid peroxidation reaction, secretion of inflammatory cytokines, and mitochondrial dysfunction in hepatocyte line, which are key events of NAFLD [19, 25, 26]. There were a number of studies described the development of NASH from steatosis through induction of oxidative stress [6, 9, 17]. Whereby, the present study attempted to simulate this event by exposing fat-accumulated HepG2 to oxidative stress inducer, MND , in which the results showed that MND elevated level of lipid peroxidation and superoxide production in FA-treated cells. Surprisingly, FA treatment decreased superoxide production whereas this increased level of lipid peroxidation (Fig. 2a-b). In previous studies, lipid accumulation in hepatocytes causes lipid peroxidation and mitochondrial dysfunction, leading to increased oxidative stress [17, 28]. Reduction of superoxide in fat-accumulated cells (Fig. 2b) was hypothesized as effects of FA treatment on OXPHOS. FA had been reported as inhibitor and uncoupler of OXPHOS in previous study , which OXPHOS is the major source of pro-oxidant production, including superoxide . Additionally, decrease in activity of OXPHOS enzymes is common in both NAFLD patients and FA-treated hepatocyte line , therefore, superoxide production might be diminished through reduction of OXPHOS activity after FA treatment. Another possibility is that FA treatment reduced the release of pro-oxidant from mitochondria. During high-energy supply, such as high accumulation of lipid; the release of pro-oxidants from mitochondria is maintained at minimal level by increasing level of antioxidants in mitochondria [29, 31]. This led to reduction of pro-oxidants, including superoxide. Oxidative stress induces protein post-translational modification by several mechanisms, including carbonylation [6, 8]. Currently, effects of protein carbonylation on development and progression of NAFLD are not fully understood. In this study, pathway analysis using Stitch, KEGG and Reactome databases demonstrated that majority carbonylated proteins are associated with NALFD pathways such as energy and fatty acid metabolisms, inflammation, fibrosis, P53 and interleukin. 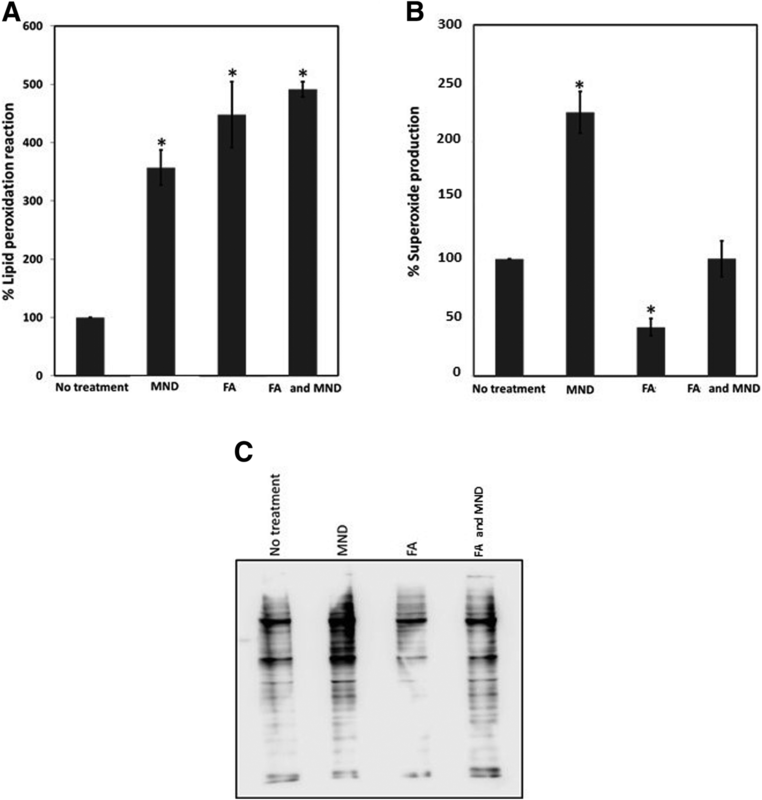 This study provided the preliminarily results which suggested that protein carbonylation might be involved in progression of simple steatosis to NASH. Previously, carbonylation of protein was considered as an irreversible consequence of oxidative protein damage, resulting in aggregation and degradation of proteins and, finally, leading to cellular dysfunction [9, 10]. However, recent studies have described that protein carbonylation can serve as thiol-mediated signal transduction, where thioredoxin activity plays fundamental role in decreasing the level of protein carbonylation [13, 14, 32]. Carbonylation on proteins can induce conformational change and affect interaction with their partners in ligand-receptor manner [13, 14]. In this study, reduction in carbonylation level was observed for many proteins, especially proteins in energy and fatty acid metabolisms. Importantly, we observed a decrease in carbonylation level of ATP5A, a subunit of ATP synthase which is a major ATP-producer of OXPHOS. In fact, carbonylated form of this protein is commonly found in physiological conditions in which it is slightly appeared during high demand of energy condition, for instance, in muscles after exercise [33–38]. It is interesting to investigate the effects of carbonylation on ATP5A activity which could, then, play important role in energy production of the cells. We have identified the carbonylation sites on ATP5A using mass spectrometry. Regarding MS results and protein database search against specific carbonylation at lysine, arginine, threonine and proline. Two out of four carbonylation sites of ATP5A (R171 and K175) are located in nucleotide-binding region. Previously, K175 was found to be essential for ATP5A activity since this site directly interacts with ATP molecule . The positive charge of amino group of K175 interacts with negative charge of the phosphate group of newly synthesized ATP . Replacement of K175 with isoleucine caused weak assemble of ATP with ATP synthase, contributing to instability of ATP-ATP synthase complex and protein malfunction . Carbonylation changed the polarity of lysine side chain from positively charge (amino group) to relatively negative of aminoadipic semialdehyde. The charge switching of this residue might critically hinder the interaction with ATP and affect the activity of ATP5A. A number of studies described energy disturbance in NAFLD patients [40, 41]. The excessive fat interrupts energy metabolism by altering the function of OXPHOS and decreasing ATP production. In animal model, OXPHOS became dysfunction and ATP production was decreased after 3 weeks of NAFLD induction. Interestingly, 7 weeks after NAFLD induction, ATP production returned to normal, indicating cellular adaptation to the disease [25, 42]. Excessive FA reduced assembly of OXPHOS units and inhibited their activities . 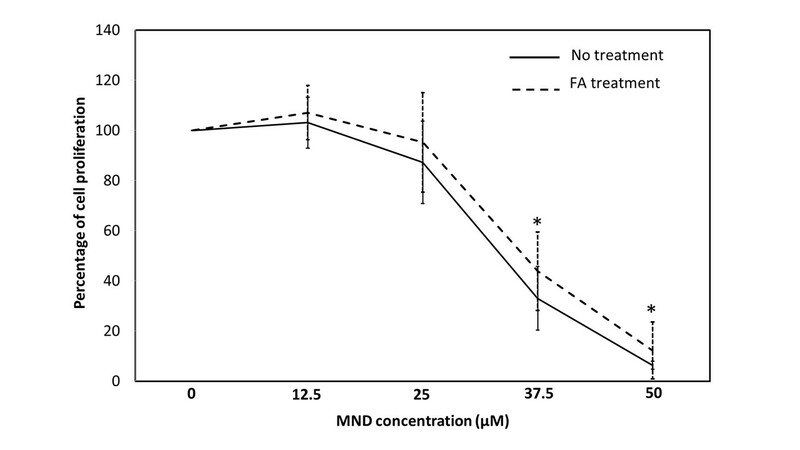 In this study, we found lower level of carbonylation of ATP5A after FA and FA/MND treatments, comparing to no treatment (Fig. 6, Additional file 2: Figure S2). The decrease in carbonylation level on ATP5A might suggest cellular mechanism in response to oxidative stress and fat accumulation. Under normal condition, it was hypothesized that hepatocytes maintain the optimum level of ATP via carbonylation of ATP5A. After FA and oxidative stress induction, OXPHOS and ATP production are decreased. As a consequence, in order to maintain ATP level, carbonylation on ATP5A is decreased. Under these conditions, the reduction in carbonylation level of ATP5A is the adaptive mechanism to enhance ATP production of oxidative phosphorylation. In summary, the present study demonstrated that protein carbonylation is likely to be involved in cellular response to development of NAFLD. Changes in level of expression and carbonylation of proteins in energy metabolism were early adaptive mechanism from lipid accumulation in oxidative stress conditions. Moreover, 3D structural model of ATP5A suggested that carbonylation sites were located in nucleotide-binding region. Carbonylation at K175 blocks the binding to ATP. It could be concluded that reduction of carbonylation of ATP5A at K175 enhances ATP production. This possibly suggested the adaptive mechanism to maintain ATP level under excessive lipid and oxidative stress conditions. We thank Center of Excellence for Antibody Research for supporting ImageQuant LAS 400 machine. We also feel gratitude to Dr. Poom Adisakwattana, Dr. Chonlatip Pipattanaboon, Dr. Chantira Suttikornchai, Miss Tipparat Thiangtrongjit, and Mr. Nattapon Simanon for their help throughout our research. This research was funded by a research grant from the Faculty of Tropical Medicine, Mahidol University and Deutscher Akademischer Austauschdienst (DAAD) scholarship, German Academic Exchange Service. PC, OR, UB, PT and ST conceived the original idea of the project. PC carried out the experiment. OR, TP and PS operated mass spectrometer. OR, UB, PT, SW and ST helped supervise the project. All authors discussed the results and contributed to the final manuscript. All authors read and approved the final manuscript. Chavez-Tapia NC, Rosso N, Tiribelli C. Effect of intracellular lipid accumulation in a new model of nonalcoholic fatty liver disease. BMC Gastroenterol. 2012;12(20). https://doi.org/10.1186/1471-230X-12-20. Aon MA, Bhatt N, Cortassa SC. Mitochondrial and cellular mechanisms for managing lipid excess. Front Physiol. 2014;5(282). https://doi.org/10.3389/fphys.2014.00282. Lennicke C, Rahn J, Lichtenfels R, Wessjohann LA, Seliger B. Hydrogen peroxide – production, fate and role in redox signaling of tumor cells. Cell Commun Signal. 2015;13(39). https://doi.org/10.1186/s12964-015-0118-6.